the notification for Jr. Engineer. In these posts 226 vacancies are available. is 18 to 40 years as on 01-07-2017. The candidates will be selected for Jr. The candidates who are applying for Jr.
for the candidates on online mode. The paper consists of 200 questions. 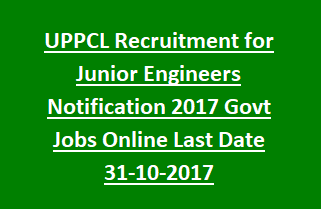 candidates may apply online through the website www.uppcl.org on or before 31-10-2017.